All that snow had to go somewhere, and one of those somewheres is the Roaring Fork River. Talbot and Michael of Blazing Adventures took our merry crew on a great ride. Normally scheduled for 2 hours, we were done in an hour and a half because the river was so full and the water moving so fast. 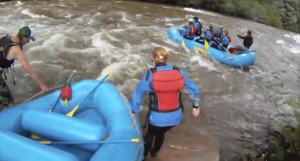 Although the river was swollen and brown with all the surrounding hillsides running off with the snowmelt from a record snow year, our guides had already run the river a number of times, without clients, to be sure the course was safe. At fist, I contemplated accepting the wetsuit they provide, but I’m glad I did. As one of our guides mentioned, “the water in the river today was snow yesterday” and there was plenty of splashing, especially since I ended up in the front of the boat. But I did manage to sit on the same side as our guide, which meant a slightly dryer ride than what Bob got on the opposite side, as you’ll see in the video below. Enjoy. This entry is filed under: Blog, North America, Raft, Video, Water.